Exhibition Catalogues - Todd Van Buskirk. Artist. 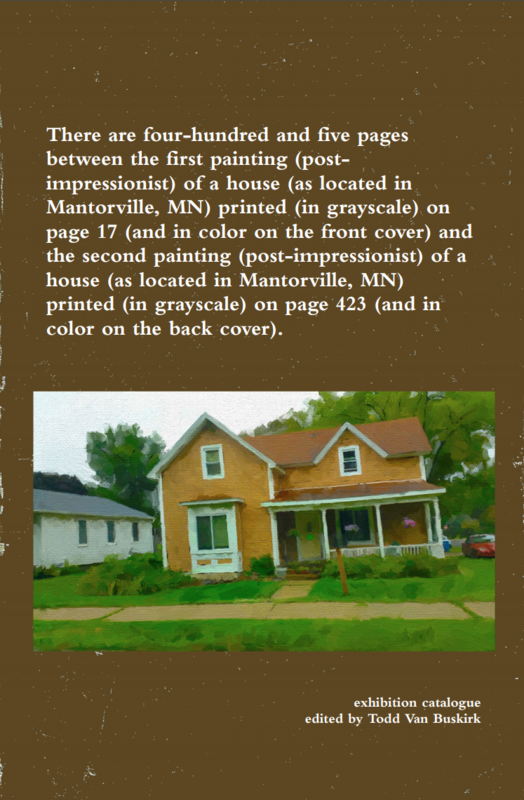 There are four-hundred and five pages between the first painting (post-impressionist) of a house (as located in Mantorville, MN) printed (in grayscale) on page 17 (and in color on the front cover) and the second painting (post-impressionist) of a house (as located in Mantorville, MN) printed (in grayscale) on page 423 (and in color on the back cover). expressionist’ painting onto page 17 (out of 32 un-numbered pages including the Title page). The remaining pages (except the Title page) are intentionally left Blank (starting on p.2). The original document size (or Pixel Dimensions) or the image is 2048 x 1024 pixels and the printed size (as printed on p.17) will be Approximately 1000 x 500 pixels. A Duchamp readymade, a Picasso still life, a Jasper Johns flag, a Judd stack — these works were all but inaccessible in a small city in Minnesota. For Todd Van Buskirk the “originals” only ever existed as copies, poor reproductions in textbooks and magazines. Van Buskirk's experiences with visual art are with those traditional exhibition catalogues, those weighty tomes with four-color images of the works, newly commissioned scholarly essays, a list of lenders and all the other usual components. Book-sized exhibition catalogues in the West typically have a colour photograph of every item on display. There will be a short formal catalogue description of each item, and usually interpretative text often amounting to one or more pages. The creative process in traditional and digital painting is more or less the same but when the digital artist is done there is nothing to hang on a wall. The painting is on the hard disk of a computer. Many people are used to following written instruction. Writing useful instructions can be difficult because people read and comprehend things differently. Keeping that in mind, it is important to convey the facts in a simple, logical manner. It is important your instructions be planned out in a logical progression. Make sure to state the problem clearly on the first page. Follow your problems with a set of specific steps detailing how to solve the proposed problem. Technical instructions must flow in a logical pattern. Write each step with concise wording so it is easily understood and completed. Give readers enough information to perform the step, avoid redundancy. Make sure the reader can locate steps quickly and easily. Make actions stand out from the rest of the text. The reason for the existence of the painting appears to be explained by the title “Abstract expressionist painting printed (in black and...” but this sentence itself isn't all together clear on the painting referenced by the title. All we know is that the painting is printed in black and white, and is located on page 201. ​Van Buskirk's experiences with visual art are with those traditional exhibition catalogues, those weighty tomes with four-color images of the works, newly commissioned scholarly essays, a list of lenders and all the other usual components. The elements of a book combine to create consonance, dissonance, tension, resolution, rhythm, mood, and color. The designer controls the relationships between text, images, and the surrounding paper pages that constrains the work. Whether the contents are visually or linguistically based, physically moving through an artwork implicates notions of sequence, repetition, juxtaposition, and duration. The interplay of text and images, as well as considerations of printing process and the design of the book, allows for exciting possibilities within narrative, media, and meaning. The reason for the existence of the painting “Grassy Field in Rochester” appears to be explained by the title “’Grassy Field in Rochester’ post-impressionist painting is rotated to the right on p.23,” but this text isn’t all together clear about the painting referenced by the text. The title instructs that the painting is located on p.23, that it is a printed image and the style is post-impressionist. The title also gives directions on how to find the painting, where we discover the reproduction is rotated to the right.